We've had a wonderfully busy week. Thursday the 23rd was our 15th wedding anniversary! Truly, our wedding doesn't seem that long ago. I guess the saying "time flies when you are having fun" is true. We went out to dinner at Ruth Chris steakhouse. It was our first time there and the staff was truly friendly and the food delicious. James had fun flirting with all the girls and talking video games with the guys. They comped our dessert - a very chocolatey creation called chocolate explosion which just melted in our mouths. Then Saturday the 25th was hubby's 53rd birthday. I promised him when we got married I wouldn't combine the dates and do a duel celebration. Have kept my promise so far. *grin* Yes, he's spoiled. Finally received all of James 7th grade curriculum and spent the weekend organizing, going through all the books, setting up notebooks, figuring out lesson plans and schedules. 85% done. We were supposed to officially start on Wednesday the 22nd, but since we didn't have any books, starting on Monday. May look like a lot but it's only 7 subjects. Really! ahem.... The bottom shelf contains the curriculum for mandatory courses along with teachers manuals. 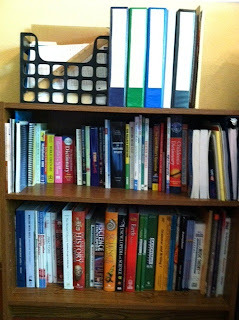 The top shelf contains all the extra stuff: character, faith, creating writing, photography, nature, game development, etc - the fun stuff!!! We'll get round to them eventually. I'll be posting a "what we're doing for 7th grade" soon! Hubby also has an ad coming out in Tapeop magazine for his latest Warmenfat design in late september so we've been working like mad on the copy for the past week. Done, submitted and we can breath for the moment. Now we just need to redesign the website. Never a dull moment in the household. More later, guys and dolls! Have a wonderful week! I commented on Facebook, but I'll say congrats on the anniversary again! Good luck with the school year. Seventh grade already? Yikes. Happy Anniversary and Happy Birthday to the Hubby!! Your dinner sounds great and I love that James was flirt!! LOL!! Glad the curriculum books finally arrived!! Happy anniversary! (And Happy bday to your hubby!) My parents have a similar thing-dad's bday is the 22nd, and their anniversary is the 23rd too. (August must be a busy month for weddings and bdays! A ton of people I know have 'em this month!) Anyways, good luck with school starting! Seeing all those books...*sighs* I miss school! Have a great week!